Namibia is a bewitching safari destination, with ample wildlife and natural beauty tucked away in its arid corners. One of the oldest deserts in the world. A unique national park teeming with wildlife. Red dune seas that appear to scrape the sky. A desolate coast stroked by a sea flush with seals, whales and dolphins. Ancient rock art sites that offer a glimpse into the past. These are the attractions that you can enjoy when you choose Namibia as your safari destination. 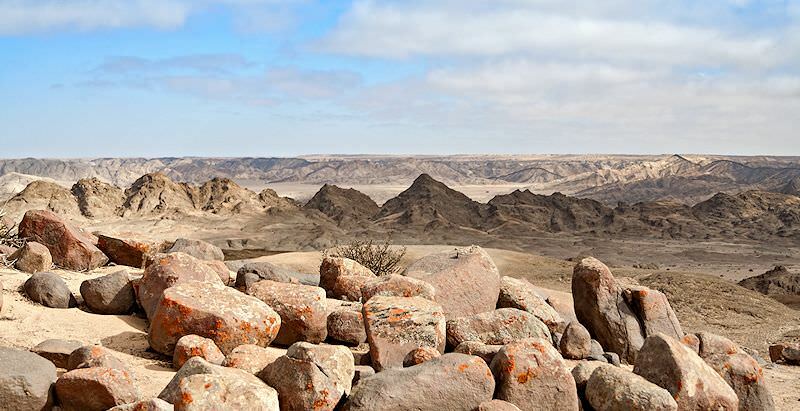 Though largely arid, Namibia actually boasts surprising variety in its offerings. From the Fish River Canyon in the south to Etosha National Park in the north, you’ll experience an ever-changing landscape, a multitude of cultures and hardy wildlife that thrives in this environment against all odds. There is also ample historical intrigue in the form of castles, forts and towns that appear to be caught in the period of their establishment. Namibia is like South Africa in that it offers exceptional value for money. In fact, the Namibian Dollar is on par with the South African Rand, which means that overseas travelers can take advantage of a favorable exchange rate (not the case in neighboring countries like Botswana, Zambia and Zimbabwe). Additionally, the country’s fine infrastructure means that guided overland safaris are possible, providing travelers with the opportunity to see more of the country. If road trips aren’t your thing, however, charter flights are available between major destinations. We offer a wide range of Namibia safari tours, from short fly-in packages to comprehensive guided trips. With years of dedicated Namibia travel under our belts, we’ve been able to narrow down the destinations that offer the most memorable experiences for our guests. Below is our guide to our best safaris in Namibia. Etosha National Park is one of the continent’s lesser known but most rewarding wilderness areas – the ultimate Namibia safari destination. At 22 270km², it is half the size of Switzerland and bigger than South Africa’s sprawling Kruger National Park. A sizable 4 590km² consists of the Etosha Pan, the immense salt flat for which the park is named. Home to four of the Big Five (save the Cape buffalo) and a multitude of desert-adapted species like gemsbok and springbok, game viewing in Etosha is remarkably fruitful. The park’s sparse vegetation means that sightings are largely unobstructed (and ideal for wildlife photography). Due to water scarcity, there are numerous man-made waterholes across the park. The result is some of the most spectacular scenes of multiple species of wildlife converging around the same oases. This three-night, four-day package is a fly-in safari, ensuring maximum time spent game viewing and minimal time on the road. The distances in Namibia are great and, while it is a captivating country to explore, ample time would be needed to ensure that you reap the most of it. That is why this short-but-sweet safari includes the convenience of both regional flights from Johannesburg to Windhoek and charter flights from Windhoek to Etosha. You’ll be staying at Ongava Lodge, which is an intimate five-star lodge on a 30 000-hectare private reserve adjacent to the park. You’ll be able to enjoy game drives both in the reserve and within the park itself, ensuring a comprehensive Etosha safari experience. 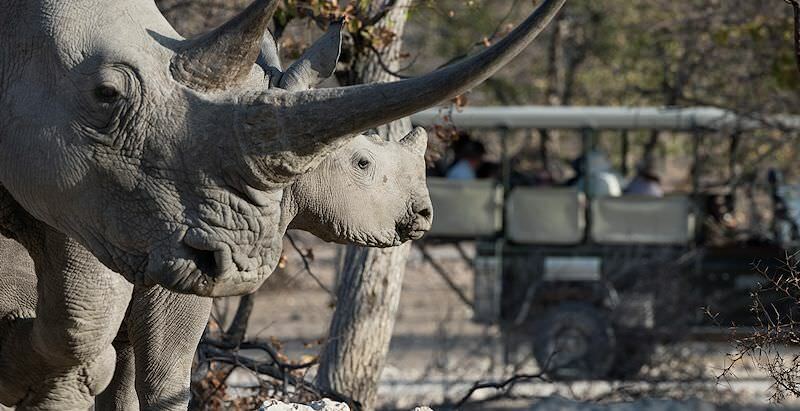 Additionally, guided nature walks with an armed ranger as well as rhino tracking are available to Ongava guests. With only twelve plush suites and a stunning hilltop perch, Ongava is one of the premier private lodges in the Greater Etosha. Full board accommodation is included in your package for the utmost convenience. In between safari activities, you can unwind poolside or get comfortable in the photographic hide for serious wildlife photography. Sossusvlei is a 32 000km2 section of the Namib-Naukluft National Park. ‘Vlei’ translates to ‘marsh’ in Afrikaans, and refers to the mud pan which fills with water every 5 – 10 years. ‘Sossus’ means “no return” or “dead end” in the local Nama language. When picturing the quintessential Namibia scene in your mind, odds are that you are imagining Sossusvlei: a shimmering red dune sea; scatterings of gemsbok; inky dead trees rooted in a stark white marsh. This unique Namibia safari destination is alternately described as otherworldly, alien, Mars-like. Despite the equally ethereal brilliance of the night skies (likely the brightest you’ve ever seen), we can assure you, however, that your feet are firmly planted on earth. This fly-in package includes regional flights from Johannesburg to Windhoek as well as light aircraft charters between the capital and Sossusvlei, sparing you five hours on the road. 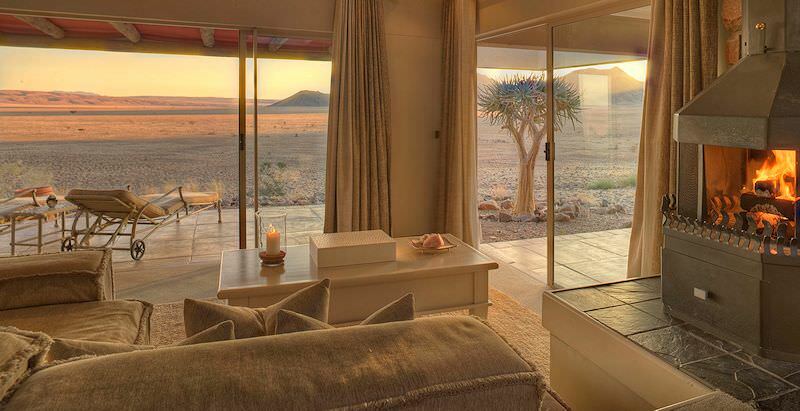 You’ll be staying at Kulala Desert Lodge within the 27 000-hectare Kulala Wilderness Reserve – the closest point of access to the dunes of Sossusvlei. Despite the appearance of seemingly nothing in all directions, a wide variety of activities are included. 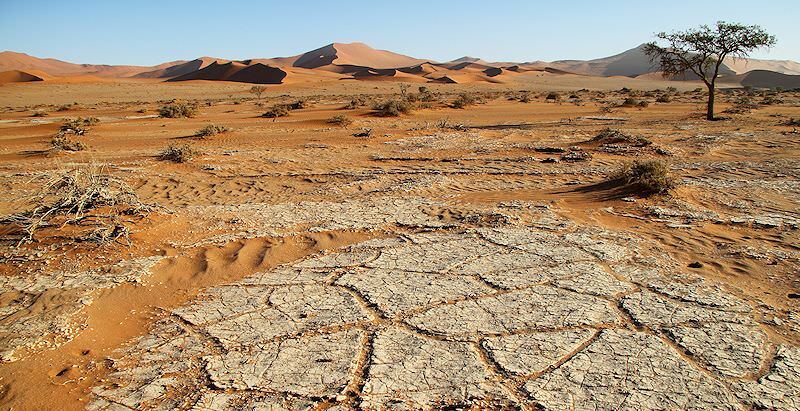 You’ll visit iconic Sossusvlei and Deadvlei, explore the geologically fascinating Sesriem Canyon, look out for brown hyena, gemsbok and bat-eared fox on nature drives in the reserve, inspect interesting reptiles and insects on guided nature walks and relish a refreshing beverage while out on a scenic sunset tour. Exhilarating activities available at an additional cost include hot air balloon safaris above the desert and sunset horse riding safaris. A unique feature of Kulala Desert Lodge’s spacious accommodation units (‘kulalas’) are the star beds on their roofs. Here you can fall asleep on plush linens and downy pillows under the effervescent expanse of the Milky Way. Additional camp features include a communal plunge pool and a wrap-around veranda with views over a riverbed where wildlife often stops by to drink. This comprehensive fly-in safari package combines the country’s top three destinations; mystical Sossusvlei, charming seaside Swakopmund and the wondrously wild Greater Etosha National Park. You’ll also enjoy a taste of the capital city of Windhoek en route, even spending the night in one of its three historic castles. After a relaxing evening in Windhoek, Sossusvlei is next on the agenda. The remote desert outpost is reached via light aircraft charter. Your accommodation for the next two nights is at the ultra-luxurious Sossusvlei Desert Lodge within the NamibRand Nature Reserve on the western border of the Namib-Naukluft National Park. With only 10 lavish units, the lodge is wonderfully intimate and exclusive. The handsome chalets have been constructed with glass and stone, blending seamlessly into the environment. Fitted with skylights for in-room stargazing, fireplaces for frosty winter nights and additional outdoor showers for adventurous cleansing, you’ll find yourself wanting for naught. Sossusvlei Desert Lodge’s full board accommodation means that, not only are your meals and selected beverages included, but a provocative bevy of activities, too; quad biking in the NamibRand Reserve, an excursion to Sossusvlei and Sesriem Canyon, guided nature walks and drives and even stargazing. Hot air balloon safaris are available at an additional cost. Next stop: Swakopmund, Namibia’s delightful coastal town, known for its inherent colonial German character. It is located where the frigid waters of the Atlantic meet the blistering sands of the Namib. Your first activity is an exhilarating quad biking excursion into the desert, after which you’ll check into the historic Hansa Hotel. Built in 1905, it is the oldest hotel in the country and sought-after for its renowned restaurant. On your second day on the Namib’s dramatic coast, you’ll enjoy a daytrip to Sandwich Harbor. En route you’ll stop at Bird Rock, a guano island inhabited by some 200 000 birds and a fine example of man's efforts to utilize the rich natural resources of the area. Thereafter you’ll journey south along the coast. Walvis Bay’s lagoon and Sandwich Harbor have both been designated as ‘wetlands of international importance’ by Ramsar. Around 40 000 birds (of 34 different species) inhabit the Sandwich Harbor marine sanctuary. You’ll be able to walk along the wind-sculpted dunes and possibly enjoy sightings of seals, dolphins and whales. The following morning, you will depart for a three-night luxury safari experience on the border of Etosha National Park. Etosha is Namibia’s top safari destination, replete with wildlife and boasting a fine infrastructure as well as a wide range of accommodation options. The game viewing opportunities are extraordinary. Despite its arid appearance, you’ll find many large mammal species thriving in Etosha, from elephants and black rhinos to major predators like lions, leopards and cheetahs. Your accommodation will be at the five-star Ongava Lodge, situated within a private game reserve on the border of Etosha. The lodge’s position means that guests can enjoy game drives both inside Ongava’s 30 000-hectare reserve and within the park itself. The benefit of staying in the reserve is that additional activities are available (and already included in your package), like guided nature walks and dedicated rhino tracking. Overland safaris typically offer the best value for money and provide avid travelers with the opportunity to see far more of the country than fly-in packages allow. The 14 Day In-Depth Namibia Overland Safari is no exception. It is our most comprehensive and wide-ranging Namibia safari, and its overland nature means that it is able to include far more off-the-beaten-track destinations. Moreover, you’ll enjoy the presence of your own dedicated African Sky guide throughout and the convenience of your own private air-conditioned 4x4 vehicle. Windhoek is first on the agenda – a relaxing breather before your Namibia safari begins in earnest. Accommodation is at the Hotel Heinitzburg, one of the capital city’s castles. The following morning, you’ll head south for the Fish River Canyon – the largest canyon on the continent and the second largest in the world. You’ll spend the evening at Canyon Lodge in Gondwana Canyon Park, which is located some 20km from the canyon’s main viewing point. You’ll head over to the viewpoints at sunset – the perfect time to observe the shifting colors of the firmament temper the dull browns of the canyon walls into warm ochers and deep reds. If you’d like, you can stop by the canyon again in the morning for a memorable sunrise, or continue straight on to Desert Horse Inn in the Aus region, famous for its wild horses. You’ll be able to observe the horses (and possibly other wildlife) when you head out on a guided drive at sunset. Two nights are spent at Desert Horse Inn. The day following your arrival will be dedicated to exploring the ghost town of Kolmanskop and the seaside town of Luderitz. Days five and six are spent at otherworldly Sossusvlei, where you’ll be able to amble along some of the highest dunes in the world. Your guide will also take you on excursions to Deadvlei and Sesriem Canyon, shaped by the Tsauchab River over millions of years. Accommodation is at Desert Camp, a basic but comfortable outpost a mere 5km from the entrance gate to the Namib-Naukluft Park. You’ll then continue through the desert until you reach the coast at Swakopmund – one of the top destinations in Namibia. Swakopmund is beloved for its old-world charm and German character that has remained intact since colonial occupation. You’ll find traditional brauhauser along with many well-preserved examples of German colonial architecture. Two nights are spent in Swakopmund where your days are spent at leisure (your guide will assist you in booking activities if you wish). The overland safari journeys north on day nine, taking the ‘salt road’ up to the Skeleton Coast. The landscape is terribly bleak, but marine wildlife thrives in the nutrient-rich waters of the Atlantic. In fact, Cape Cross is home to one of the largest colonies of Cape fur seals on the continent – some 80 000 individuals. After viewing the seals, you’ll head inland toward the Damaraland region, spending the evening at Palmwag Lodge. The final four days of this comprehensive safari are spent in Etosha National Park – Namibia’s most wildlife-rich safari destination. Your stay will be divided over two rest camps within the park itself – typically Dolomite and Okaukuejo – ensuring in-depth exploration of this prolific wilderness area. Days will be spent game viewing in the company of your African Sky guide, or relaxing in camp. A highlight is sure to be to the waterhole at Okaukuejo, which is floodlit at night. Fantastic sightings have been enjoyed without even leaving camp. Etosha supports a startling amount of wildlife, including exciting species like the desert black rhino and endangered cheetah. Other major mammals include elephants, lions and leopards, while prominent plains game species include springbok, gemsbok and even the stately eland. The park’s arid expanses are actually part of what makes it so appealing – unobstructed game viewing that is ideal for wildlife photography. Your safari in Etosha will be most rewarding.